Gunshot wounds are not enough to stop Denver Police officer Tony Lopez Jr. A week after he was shot five times at a traffic stop, Lopez took his first steps through the halls of Denver Health. The police department shared Facebook photos of Lopez's walk, which he did Tuesday in front of other officers. Among them was his father, Tony Lopez Sr., a commander with Denver Police Department. 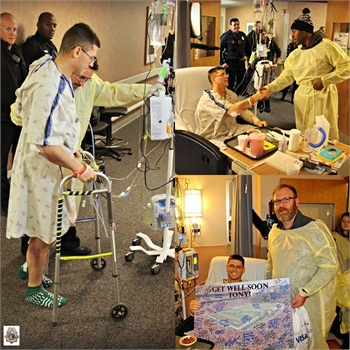 The wounded officer underwent his third major surgery on Friday. His sister has said that Lopez already asked repeatedly to get back to work, ABC 7 reports.